OK, evidently I’ve been living in a cave because I only just recently became aware of “bubble up” pizzas and casseroles. That's where you use canned biscuit dough which "bubbles up" as it bakes in a casserole type recipe. Seriously? Where have I been? I decided to try out making a bubble up pizza this weekend but wanted to use pizza dough instead of biscuits because… well, it’s a pizza dish. From what I can tell, it’s a pretty standard recipe but I changed mine up a good bit. I sprinkled the dough with garlic, kosher salt and parmesan (so it would be kinda like a bunch of garlic knots), used marinara sauce, Italian sausage, fresh basil and boat load of fresh mozzarella. A boat load of it. About that… taheeeee… I thought I’d bought an 8-oz. package but I really bought a 16-oz. package and didn't realize it until I was done assembling it. I thought it looked like an awful lot of cheese! Well, let me just tell you what. This stuff was the cheesiest, gooiest, yummiest pizza concoction ever! Feel free to use less but oh lawwww, it was good with all that cheese! Remove casings from sausage if applicable then break sausage into bite-size pieces with your fingers. Add sausage pieces to a large skillet and brown over medium-high heat until cooked through, leaving them in the small pieces so that they resemble little meatballs. Set aside. Drizzle a 13x9 baking dish with a little olive oil. Use your hands or a paper towel to spread the oil in the bottom of the pan to coat it well. Unwrap pizza dough but don’t unroll it. Cut the roll in half lengthwise then cut each half lengthwise as well so you end up with 4 long strips of dough. Cut each strip into 10 pieces. You should end up with 40 little nuggets of dough. Place the pieces of dough in the greased baking dish. If the smaller inside bits of the dough roll separate, that’s ok, just throw it all in the dish. Sprinkle dough with garlic, salt and parmesan cheese. Pour marinara sauce over dough. 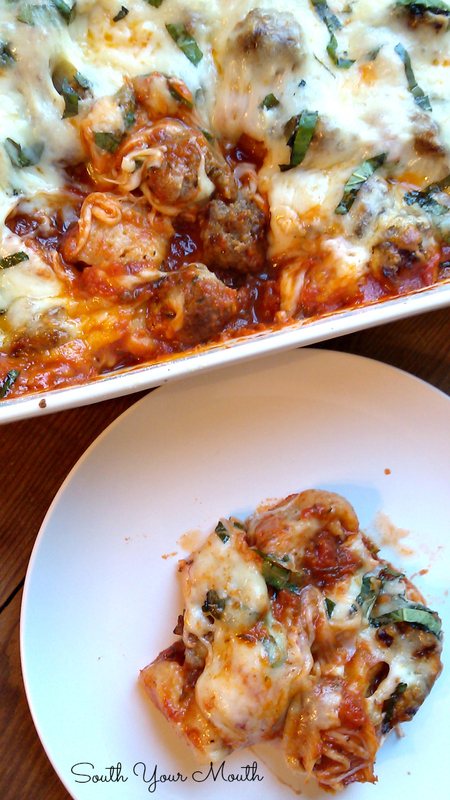 Arrange sausage pieces over sauce then top with half of the mozzarella. Bake at 350 degrees, uncovered, for 15 minutes. Remove from oven, top with a little fresh basil then remaining mozzarella. Continue baking, uncovered, for 20-25 minutes or until cheese is bubbly and starting to brown. Serve with more fresh basil if desired. *The pizza dough doesn’t cook up as fluffy as traditional canned biscuits. If you’d prefer an airier dough, substitute with a 14-oz. can of biscuit dough, quartering each biscuit. I prefer the pizza dough but use whatever you like best! I'm sorry but I'm always a downer. On a really strict diet so many of your recipes that make my mouth fall open I just can't have but I can see some possibilities for this one. At Trader Joe's they have fresh whole wheat pizza dough and low fat pizza sauce. 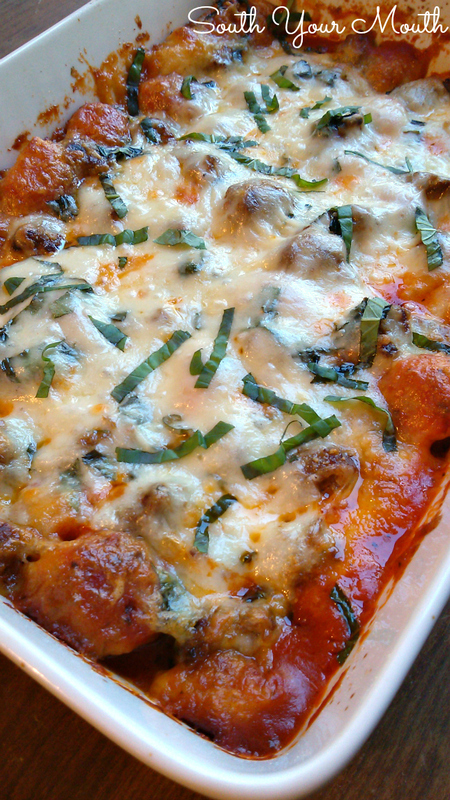 You can also buy chicken or turkey Italian sausage and Mozzarella easily translates to low fat. Yipee. I think I can have some of this-can't wait. I make a Weight Watchers version of this and it is magnificent. One of the recipes my husband loves best. This is super easy to lighten up and you still get a huge portion. I divide an 8x8 in four pieces.